If you’re in the northern hemisphere, you know that we are approaching the darkest time of the year. As we near the winter solstice, the days are getting shorter. The lack of sun can even impact people’s moods and outlook. At Christmastime, many hang lights to adorn trees and brighten homes. It distracts you from the darkness. From a worldly perspective, it adds some cheer to the drear. The world was waiting in darkness. Prophets spoke of a coming Savior, but it was only a flicker of hope in an otherwise dark world. Then Jesus entered the scene on that first Christmas and shattered the darkness. 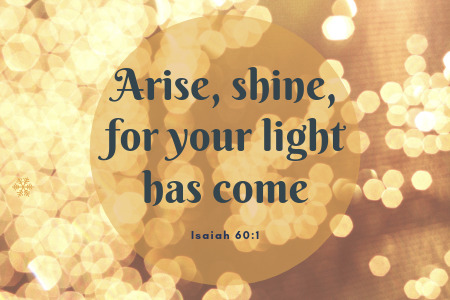 Isaiah described that day: “Arise, shine, for your light has come” (Isaiah 60:1). Death and darkness could no longer reign because life and light had come into the world. A new day had dawned. Sadly, some in the darkness have not understood the light. On the surface, who would argue? Visit the sick. Feed the hungry. Help the needy. Love your neighbor. After all, Jesus said, “You are the light of the world…Let your light shine before men, that they may see your good deeds” (Matthew 5:14,16). Those are all good things to do. They lift spirits and spread cheer. They demonstrate love. People will thank you and you’ll feel good…for a time. But their scope is limited. They are temporary. It’s like holding a single, dim Christmas light in the darkest of night. If you make that small light your focus, you’ll remain in the shadows of the night and never know the beauty of the day. Jesus said, “I am the light of the world. 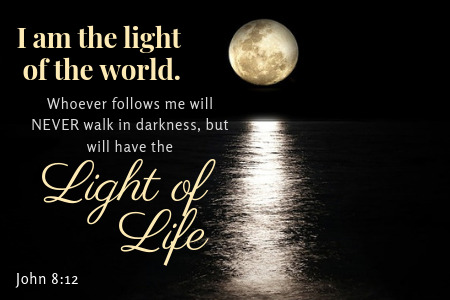 Whoever follows me will never walk in darkness, but will have the light of life” (John 8:12). He’s not telling us to follow his example and become lights ourselves. That would be far too dim. Instead he’s telling us to stay close to him, because he is the light. He didn’t do some good for 25 days; Jesus was perfect every day. John the Baptist understood this. “He himself was not the light; he came only as a witness to the light” (John 1:8). John was considered perhaps the greatest of the prophets not because of his own good, but because of his proximity to Christ. He pointed others to the true light. God calls us to do the same. We are the light of the world in the sense that we reflect the light of Christ, just as the moon reflects the light of the sun. That may happen as you visit the sick, feed the hungry, help the needy or love your neighbor. Only now you’re not drawing attention to your light, but pointing people to his. As you let that light shine, people will “praise your Father in heaven” (Matthew 5:16). Many, including our Mormon friends, rise from bed to spiritual darkness. They focus on the small spark of fleeting lights because it’s all they know. But that’s changing. More people like you are helping them to see Jesus in a new light by witnessing to their Mormon friends and family. He’s done it all. Living eternally with Heavenly Father is guaranteed. We already have his love. Friends, that’s a message the darkness can’t stand up to. So share that message boldly because it alone has the power to light the world! This week’s witnessing tip takes a look at how the Christmas lights you string on your house can actually open the door to a witnessing opportunity.